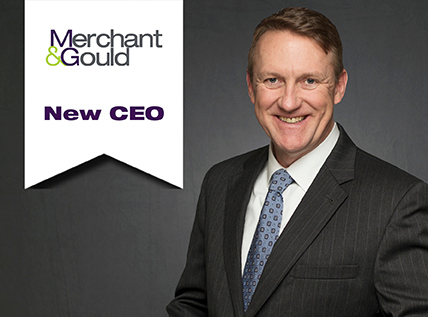 Merchant & Gould is pleased to announce that Christopher J. Leonard—managing partner of the firm’s Knoxville, Tennessee, office—will succeed Brian H. Batzli as the CEO, Managing Director, and Chairman of the Board on July 1, 2018. After eight years of successful leadership, Brian will finish his current term as CEO, Managing Director, and Chairman of the Board at the end of June. The firm thanks him for his excellent and devoted service in this leadership position. On July 1, Brian will become Chairman Emeritus and will resume his practice of strategic intellectual property counseling and patent prosecution in the electrical, mechanical and software arts. Chris Leonard founded and managed the firm’s Atlanta office for eight years beginning in 2000. In 2008, he founded the firm’s Knoxville, Tennessee, office. In addition to leading two of the firm’s eight offices, Chris served on the firm’s Executive Committee for seven years, and he served as chair of the firm’s Electrical and Software Practice Group twice. Chris began his career as an intellectual property attorney in 1994. His practice focuses on counseling clients on matters relating to software, electronic commerce, healthcare data management systems, telecommunications and traditional electrical and mechanical technologies. His practice encompasses U.S. and international patent prosecution, patent infringement and validity analysis, and licensing counseling. He also has extensive litigation experience in all areas of intellectual property law, including patent, trademark, copyright, trade secrets and unfair competition. Prior to becoming an attorney, Chris served as an officer in the U.S. Air Force where he worked with the ground-launched cruise missile weapon system. In that position, he was selected to lead Soviet weapons inspectors through detailed inspections of U.S. nuclear weapons systems in accordance with the Intermediate-Range Nuclear Forces Treaty between the United States and the former Soviet Union. Chris holds a B.S. in Industrial Engineering from the University of Tennessee, a certificate in Software Engineering from the Georgia Institute of Technology, and a Doctor of Jurisprudence from the University of Tennessee College of Law. He is a graduate of the Harvard Business School General Management Program and the National Institute for Trial Advocacy. A registered patent attorney before the U.S. Patent and Trademark Office, Chris is also a member of the State Bar of Georgia, the Tennessee Bar Association, the American Bar Association and the American Intellectual Property Law Association.